Putty colored… everything. Us (especially my nails), our cockpit, our cabin floor, everything around the boat. No, no photos as I didn’t want to risk getting grit in my camera. 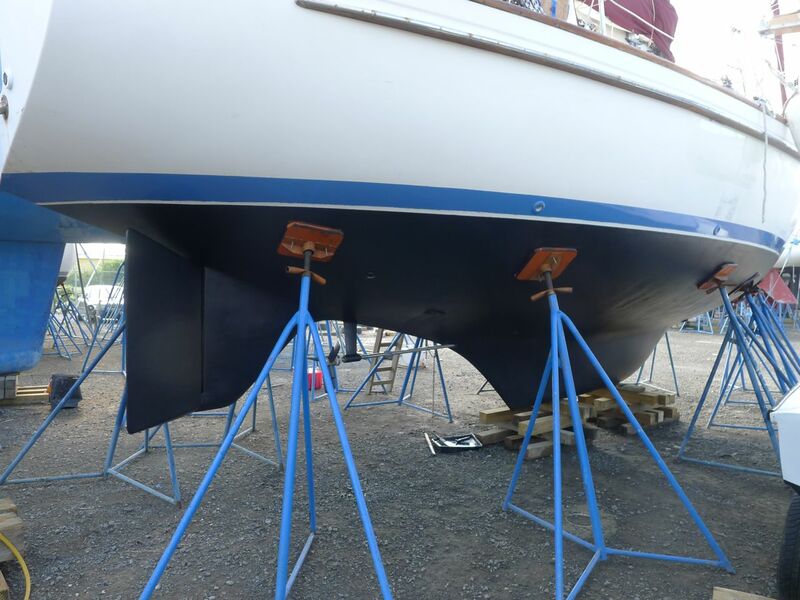 Hand wet sanding what was left of the midnight blue – but think grease-colored – antifouling paint on Journey’s hull is a dirty, gritty job. Even with lots of water to keep everything washed down, including us, with soap, too, it’s still just nasty. 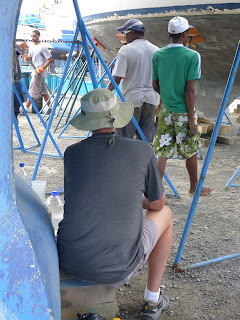 But lots of sanding is what it takes to make sure our hull is not encrusted with barnacles and other sea critters between now and our next planned hull painting in about 2 years, in Panama. Along the way, lots of hurry-up-and-wait. We’re in the yard at 8 am. No, we’re not. 11 am, no, we’re not. 1:30 pm. Oh, wait, could you be here, now? Ok. Oh, that takes another several hours and it’s actually 4:30, shortly before quitting time that we can begin. Next morning, several, “Stop!”s as the Travel Lift was replaced with stands. consider the home we hailed from. tempting to call Everett "home." Then, we find out that we’ve got to start and finish painting today, for the paint to set for 12 hours before the Travel Lift “splashes” us back into the water. 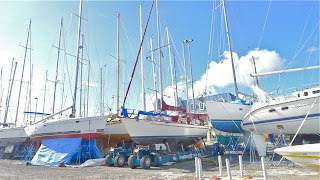 The yards will be unstaffed for holiday this Sunday and Monday, so we have to be out this Saturday or wait until Tuesday. 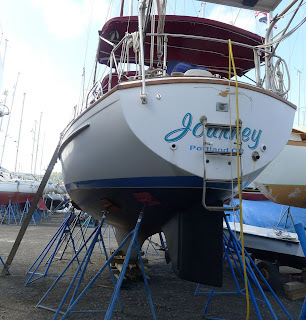 Just as we’re ready to paint, it starts to rain…. Looks like we’ll be out of “the yard” and back anchoring before indulging in a romantic motel escape after all. Ok, I confess – power, giving us the ability to run our on-board air conditioner meant our boat was cooler and drier than many local motels. Home sweet home, getting sweeter, bit by bit.